This is me, a few years back, teaching in Munich Germany. I have had the pleasure of teaching since 1980 in multiple locations- Poona India, Toscana Italy, Byron Bay Australia, Oregon USA, Singapore, Kuala Lumpur,Toronto Canada, and...well, a lot of other places too. 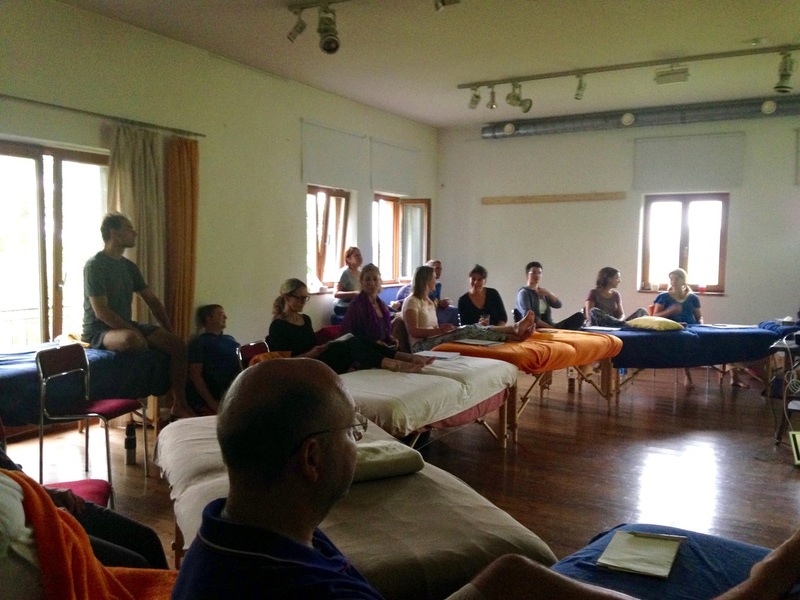 Big trainings with 40 plus eager participants plus assistants and other teachers, as well as smaller weekend advanced workshops with a handful of thirsty advanced practitioners . Here is a current group of students, studying through the Rebalancing Schule Munchen. Some study in Germany, some in Switzerland and the two groups come together several times a year to learn and spend time together, usually in a seminar house situated in a natural setting. Half of a classroom set-up suitable for a demonstration, with tables in a circle, one in the middle where the teaching happens. Then, we get to practice what has been shown. This is a different group, but also from 2016.